321. A tamed elephant is led into a crowd, and the ruler mounts a tamed elephant. Best among humans is the subdued one who endures abuse. 322. 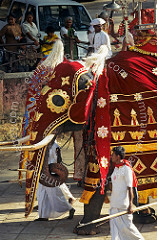 Excellent are well-trained mules, thoroughbred Sindhu horses, and noble tusker elephants. But better still is the person who has subdued him or herself. 323. Not by these mounts, however, would one go to the Untrodden Land (nirvana), as one who is self-tamed goes by one's own tamed and well-controlled mind (heart). 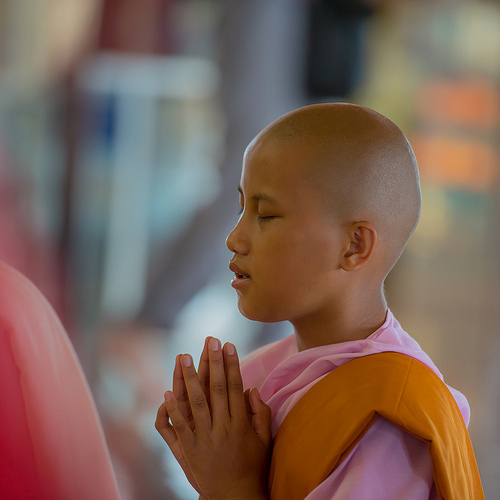 The American Buddhist nun Ayya Tathaaloka giving the gift of the Dharma (bhikkhuni.net). 324. Musty during rut, the tusker-elephant named Dhanapalaka* is uncontrollable. Held in captivity, the tusker does not touch a morsel of food, but only longingly calls to mind the elephant forest. 325. When a person is sluggish and gluttonous, sleeping and rolling around in bed like a fat domestic pig, that sluggard undergoes rebirth again and again. 326. Formerly this mind (heart) wandered about as it liked, where it wished and according to its pleasure, but now I shall thoroughly master it with wisdom as a mahout controls with ankus an elephant in rut. 327. Delight in heedfulness! Guard well your thoughts! Draw yourself out of this bog of harm, even as an elephant draws itself out of the mud. 328. If for company you find a wise and prudent friend who leads a good life, you should, overcoming all impediments, keep that person's company joyfully and mindfully. 329. If for company you cannot find a wise and prudent friend who leads a good life, then, like a king who leaves behind a conquered kingdom, or like a lone elephant in the elephant forest, go your way alone. 330. Better it is to live alone; there is no keeping fellowship with a fool. 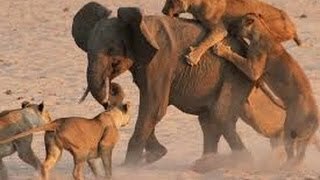 Live alone and do no harm; be carefree like an elephant in the elephant forest. 331. Good are friends when need arises; good is contentment with just what one has; good is merit when life is at an end; and good is the abandoning of all suffering (through enlightenment). 332. In this world, good it is to serve one's mother, good it is to serve one's father, good it is to serve monastics, and good it is to serve the enlightened persons. 333. Good is virtue until life's end, good is confidence that is steadfast, good is the acquisition of wisdom, and good is the avoidance of harmful karma. 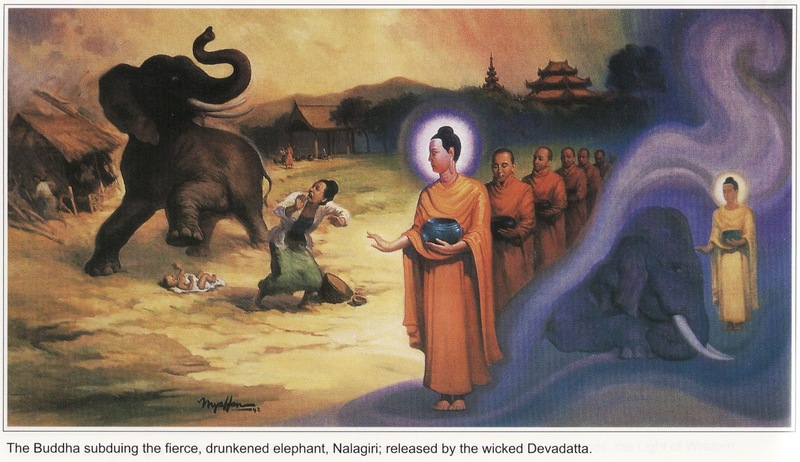 Drunk Nalagiri charges the Buddha who responds with loving-kindness taming the beast. Nālāgiri was an elephant who lived in the royal stalls at Rājagaha. Ven. Devadatta, after several vain attempts to kill the Buddha, obtained Prince Ajātasattu's consent to use Nālagiri as a means of bringing about the Buddha's death. 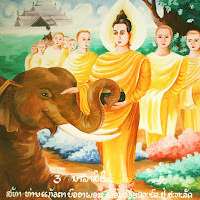 The elephant, he said, knows nothing of the Buddha's virtues. He will have no hesitation in destroying him. 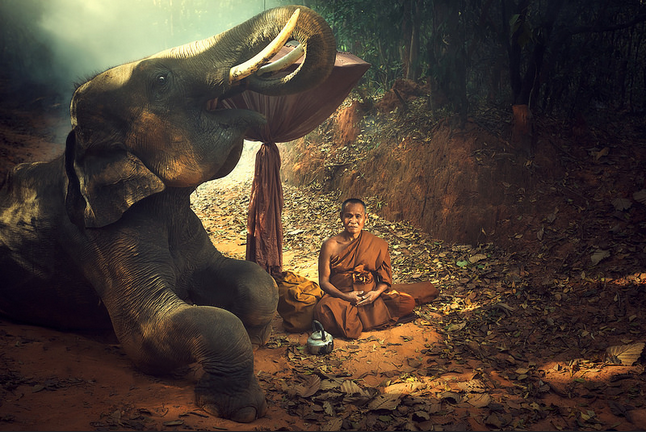 Nālagiri was indeed a fierce animal, but in order to increase his fierceness, Devadatta instructed his keeper (mahout) to give him twice his usual amount of alcoholic toddy. A proclamation was then made with the beating of drums that the streets of the city should be cleared as Nālāgiri would be let loose upon them. The people ran, but Ananda stepped in to save the Buddha. The Buddha saved himself and the royal elephant Nalagiri, who was soothed with waves of loving-kindness (metta). 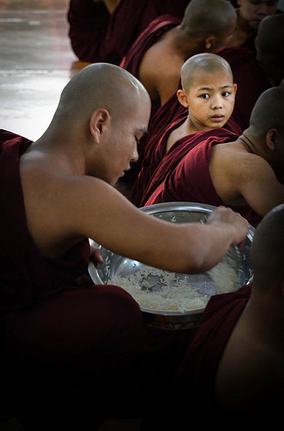 The Buddha was informed of this and warned against going into the city for alms. He ignored the warning and went into Rājagaha with monastics from the city's 18 monasteries. At the sight of the tusker elephant Nālāgiri, the people fled in terror. Ven. 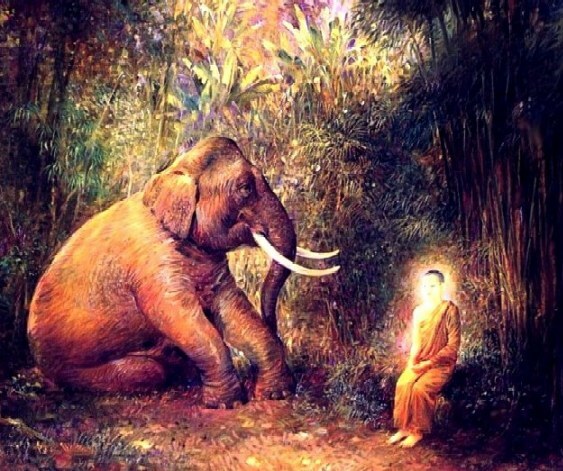 Ananda, on seeing the elephant advancing towards the Buddha, went in spite of the Buddha's orders to the contrary: he stood in front of the Buddha, who had to make use of his supernatural power to move him. Just then a woman carrying a child saw the elephant coming and fled. In her terror she dropped the child at the Buddha's feet. 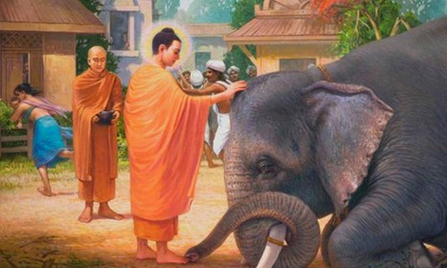 As the elephant was about to attack the child, the Buddha spoke to him, suffusing him with loving kindness and, stretching out his right hand, he stroked the animal's forehead. Thrilled with joy at the touch, Nālāgiri sank on his knees before the Buddha, and the Buddha taught him the Dharma. It is said that had the elephant not been a wild beast, he would have become a stream enterer. Marveling at the sight, the assembled people threw all of their ornaments on the elephant's body covering it. 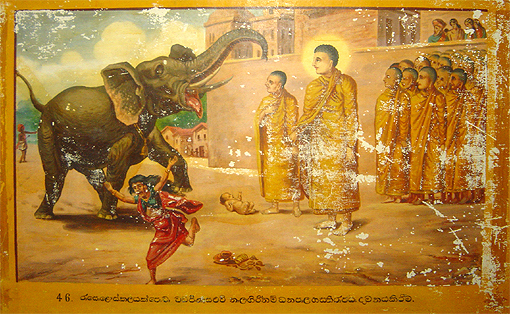 And henceforth the elephant was known as Dhanapāla (Dhanapālaka). 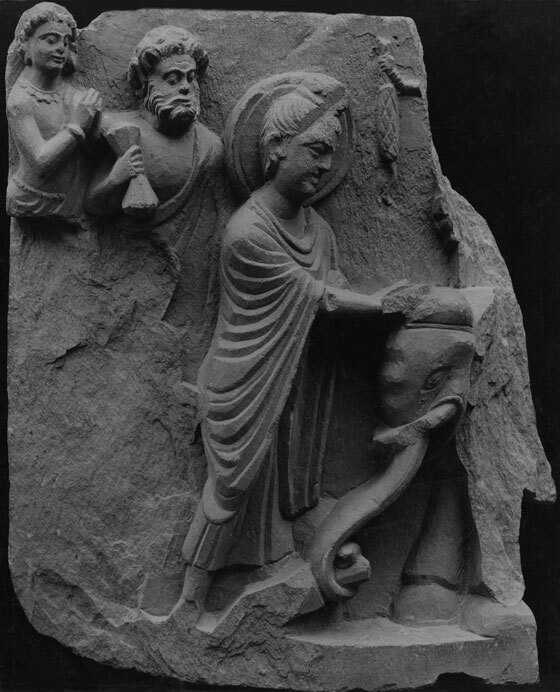 The Buddha returned to Bamboo Grove and later that day recounted the Cullahamsa Rebirth Tale (Jātaka) in praise of Ananda's loyalty (Vin.ii.194f. : J.v.333ff. ; Avedānas i. 177). It is said (Mil. 349) that 900 hundred million living beings who witnessed the miracle realized the truth. The Bodhisattva [the Buddha before enlightenment] in a past life was once riding an elephant when he saw a non-teaching buddha. Intoxicated by his own glory, he made the elephant charge at him. 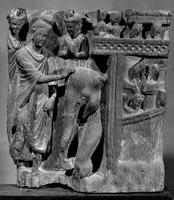 It was as a result of this action (karma) that the Buddha, in this rebirth, was charged by Nālāgiri (UdA.265; Ap.i.300). Compare at Donamukha.